*Small group mini-lesson: Can be done in one lesson or over several lessons. Students work in small groups to create their own theme and variations, using a known song! 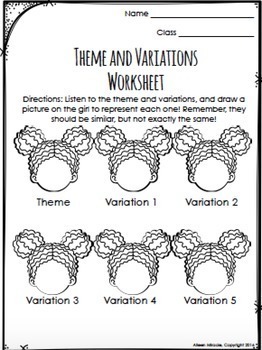 Worksheet for this activity is included. 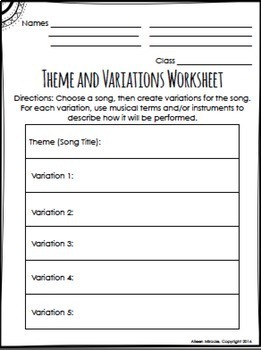 *Theme and Variations worksheets for lower elementary: Perfect worksheets for introducing the form to your second or third graders. Students listen to a piece, then draw different expressions on students for each variation! Four worksheets are included--two boys and two girls. 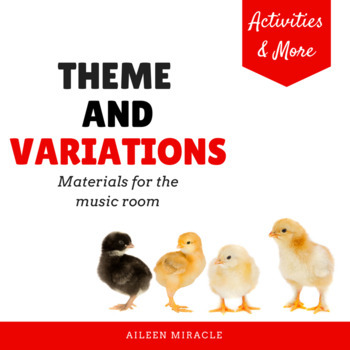 *Link to Spotify Playlist: Playlist includes three well-known theme and variations pieces that work well with elementary or middle school. Includes Mozart's "Ah, Vous Dirai-Je, Maman," Ives' "Variations on America," and Beethoven's "Seven Variations on 'God Save the King.'" Spotify is free; you just have to sign up for an account. 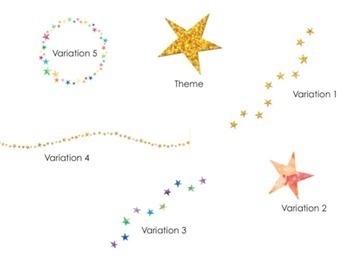 *NCCAS Standards: This unit is aligned with several NCCAS music standards; these are listed in the small group mini-lesson as well as the directions for the set. Please keep in mind that due to copyright, no music is included. You can use the music in the Spotify playlist, or music in your own music library.